I bought half a lamb recently from a brilliant smallholding near us and have been looking for good recipes for the liver, so really pleased when I saw this, thanks! 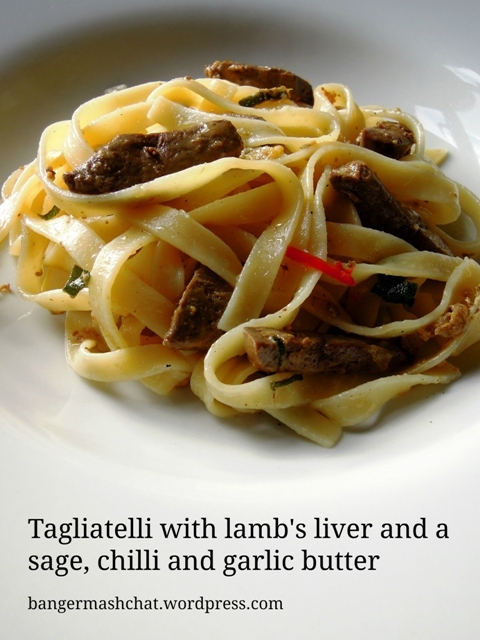 Now I do like lamb’s liver and this looks LUSH. And I’d never have guessed it could come in at such a low price, congrats you on the brainpower for your £3 challenge! So going to try and get a recipe out for the challenge too. What a GREAT budget meal and so elegant looking too, I love this idea! Also LOVE the use of sage in this recipe too! Mmm I have a weakness for liver but don’t eat it that often. Looks stunning! Thanks for entering into CCM, round up on Dinner With Crayons later today. Looks beautiful and can’t believe how economical this is. 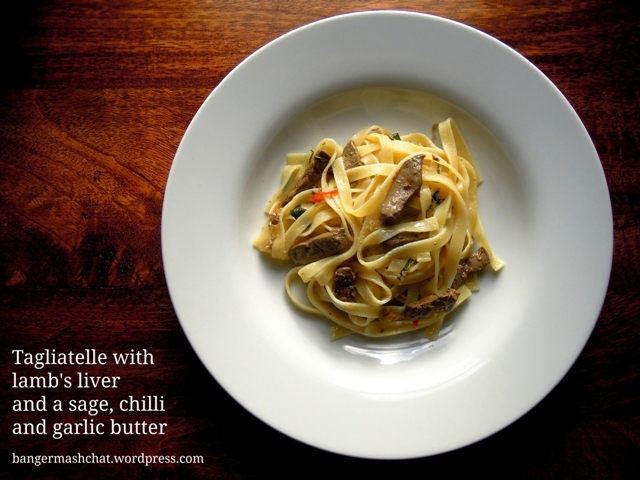 Thank you for submitting this recipe to this month’s Pasta Please Challenge. Thanks Tina. Cheap and tasty is a great combination! Thanks for this recipe. I I love liver and I have sage growing on my patio. I’m cooking this tonight, though I don’t like chilli so will replace it with some wild garlic I found recently in the woods. With regard to the ‘€3 Challenge’ many poor people don’t have gardens or the skills to forage or, to be honest, the energy or will to be innovative. Poverty destroys the spirit quicker than most of life’s setbacks. Well said, my thoughts exactly.